Here again, I will share pictures I captured at the party, to share the hard work and creativity of the birthday boy’s mom, for your enjoyment. 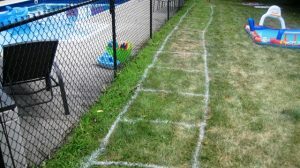 My daughter and daughter-in-law go all out to prepare these birthday parties for their children, and I admire their talent, but it takes a LOT of planning and preparation (dad’s help as much as they can…but…it’s all about the mom’s work). As always, there were plenty of cold drinks on the picnic tables, refreshing salads, meat and vegetarian subs, fresh fruits and vegetables, chips and dips…and desserts. 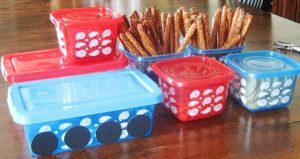 Anyway, at least I have some pictures of the snacks for the kids, nicely served in the creatively prepared ” train wagons”. 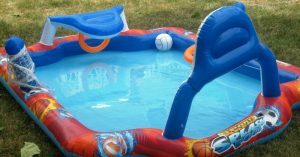 Since this is a hot day summer party, it all takes place outside and around the pool. 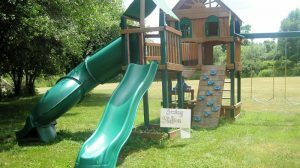 The mom of the birthday boy used poster board and created a train, attached it to the fence around the pool, and filled each wagon with bunch of pictures from her son’s activities throughout the year. I love it, and he enjoys reminiscing about those fun things he did with his family and friends. The train was creatively hand-crafted from boxes wrapped in bright-color wrapping paper, with black plastic bowl in front, and colorful pinwheels on top, which gave it an effect of a moving train, while the wind was making them twirl around. 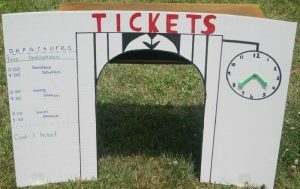 The ticket booth offered tickets to different fun destinations, with leading tracks towards these places. Dad was in charge of marking the train tracks leading to all the specific stations. 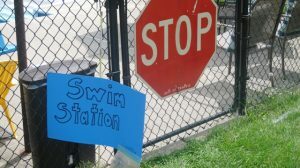 This one is around the pool, leading to the “Swim Station”. The boys had so much fun cooling off in the pool, accompanied by their parents, who enjoyed it as much as the kids. 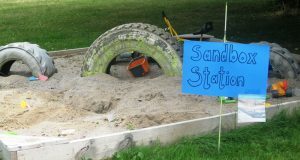 When the Dad constructed this huge sandbox, he probably never thought it would become such a center of attention on special occasions…..so worth all the effort. Nice job! 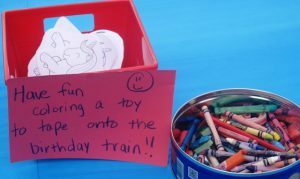 These two stations were set up at the picnic tables, so they little “Train Engineers” and “Train Conductors” could sit down for a minute, relax, and play with the train, or color pictures to decorate the Birthday Train for their Birthday Friend. 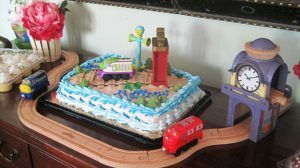 Mom added special effect to this Birthday cake…incorporating train tracks, clock tower, and his favorite train cars…..so thoughtful. As all good things must come to an end….so do fun birthday parties. 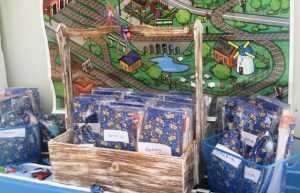 This one ended with a special “Thank You” treat bag for each attendee, filled with many fun, train related things, to enjoy at home.